Chris is a very touchy-feely cat and loves to lie against, or on top of, any cat or human that will tolerate it. This time it is Floki but now he is on my lap as I write this. Does anyone else have a touchy-feely cat like Chris? 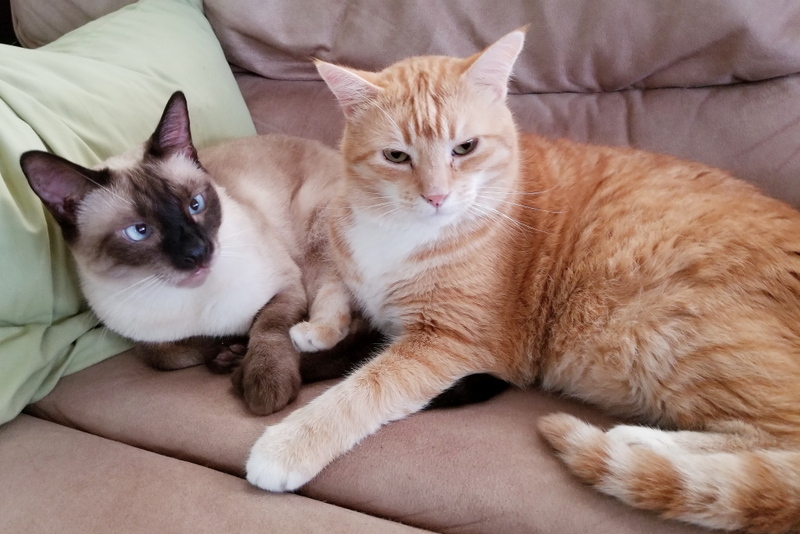 This entry was posted in Uncategorized and tagged Cats, cute, ginger, gold, Siamese on July 6, 2018 by Charles Huss. Teddy is not at ALL a touchy-feely kitty (unfortunately! )……he doesn’t like to be picked up, he DOES like to be petted (a bit) and follows me around like a puppy would, but touchy-feely he’s not. I’m hoping maybe as he ages he’ll get to appreciate laps more! If you do get #3, make sure she, or he, gets along good with other cats. That might help. In the winter, the cats are extremely cuddly with us and with each other. But I think it’s a warmth thing. I’m very sad Puck is gone because Chris loved him. Yeah. That’s the only problem with getting attached. Sometimes you hurt more for the other person than for yourself. Yes, and it’s tough for Chris because he loves everyone. You are like our Floki. My human is wondering where the touchy-feely cats are around here – she’s currently catless in her office chair! Some minutes my cat is kind of cuddly, rubs herself at my thigh next to me on the couch – and then again, she is not coming anywhere close … And I certainly cannot hold her. But when the vet got her out last year for a checkup after a teeth-removing surgery, she wrapped herself around the vet’s hand. African Wild Cats, the domestic cat’s ancestor, are basically loners, especially the males, so it doesn’t surprise me that many cats are only affectionate occasionally. Chris has always been an outlier. But today’s house cats are organising themselves in little groups – in villages they gather, sometimes two get along like two peas in a pod, sometimes not, but all in all – look at the cats at the Colosseum in Rome – they are more of a social animal these days. You are right. They have become much more social than their wild ancestors. Yes, Wally is just like Chris….but we think you knew that. That is sweet. None of mine like to cuddle near another kitty. I would think with 13 cats, someone would be a cuddler.